And heres where we are snow-wise. The mailbox is approximately 5 feet tall. There is more snow forecast for tomorrow, and then, a possibly larger storm this weekend. Might be time to get out the winter mailbox. We are about to lose sight of the road signs. 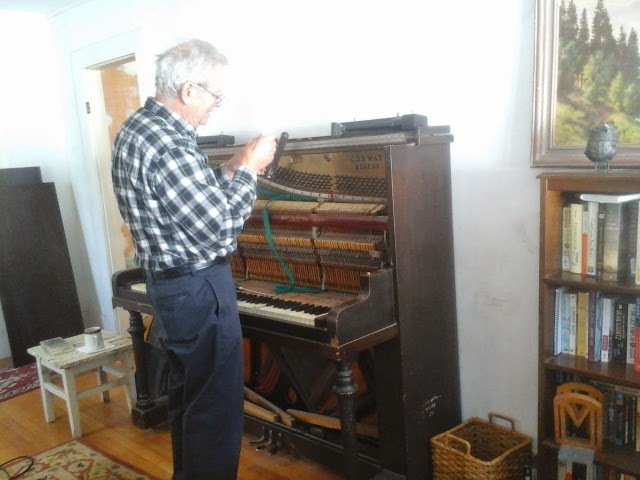 Today, the piano tuner came to look at the old antique upright that was left in the house. 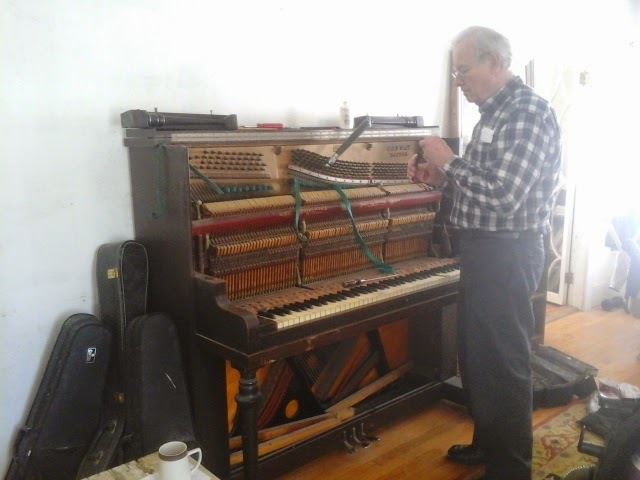 He is a delightful person, with many stories from his 56 years of tuning pianos. He loves what he does. I thoroughly enjoyed the visit. Turns out the piano was built in 1911, by the Conway company in Boston. It is in pretty good shape for its age, especially considering that a piano's lifespan is considered to be 50 years. It still has the old ivory keys, except for one, that he replaced today. Ivory is no longer available, even recycled ivory from other old instruments. The old gal sound great now. He even played a few songs for me. 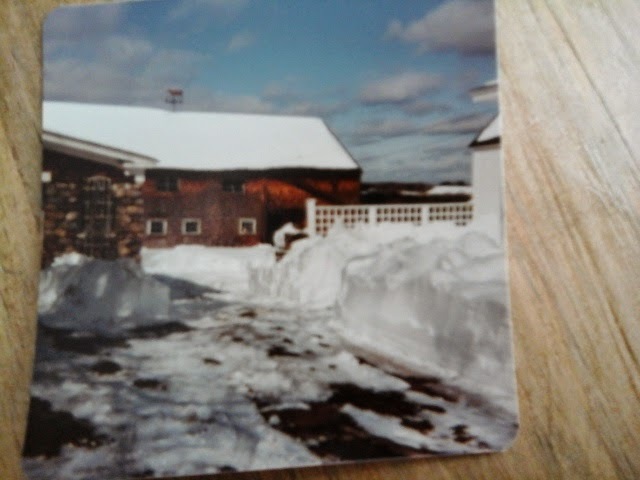 The old barn in winter. I wish it were still here. The original house burned down sometime in the 1800s. The current house was built on that foundation, which is why it seems much older.. it IS much older. At one point, the house was a tavern. At another point, a minister lived here. We are slowly learning some of the history. The farm as it is now, is 7 acres. Most of the forested acreage was sold and put into conservation, and it is across the road, abutting another thousand acres of state forest. Because of this, and another 800 acres of conserved land behind our pastures, there is abundant wildlife, including the larger predators..(something to be aware off, but not to worry).. The higher pasture areas were kept by one of the family members, and they built a house and settled next door. it has been a number of years, at least 20, maybe longer, since the farm had livestock other than a few chickens and ducks. In our planning to return the land to productivity, and attempt to grow as much of our own food as possible, we hope to incorporate livestock again. exactly what that will look like, I dont think I can say for certain. It is a journey. I dream of a family cow. Just sayin'. Weather: it was 1 degree this morning, sunny, and a high about 26. The sunshine w as delightful. The live stock would be very cool. Before you know it, Steve will be wearing cowboy boots and wranglers! Also, what is the "winter mailbox?" funny but true. 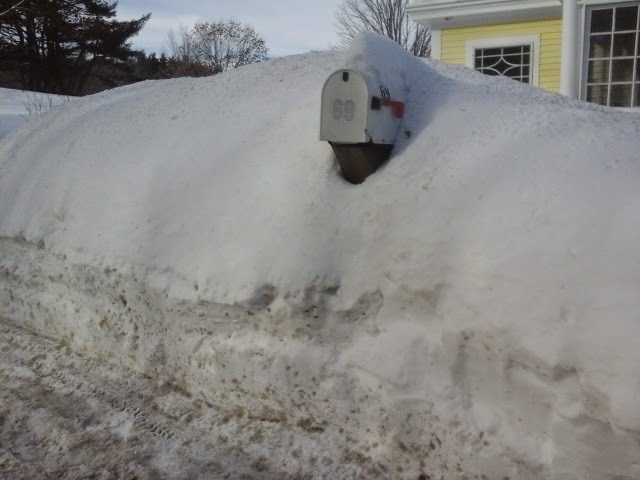 Many new englanders keep a spare mailbox on hand because at some point, the mailbox either gets buried in the snow, or destroyed by the plows. there are various other creative ways of keeping either of those things from happening. Maybe a post one day would be a photo tour of mailboxes! 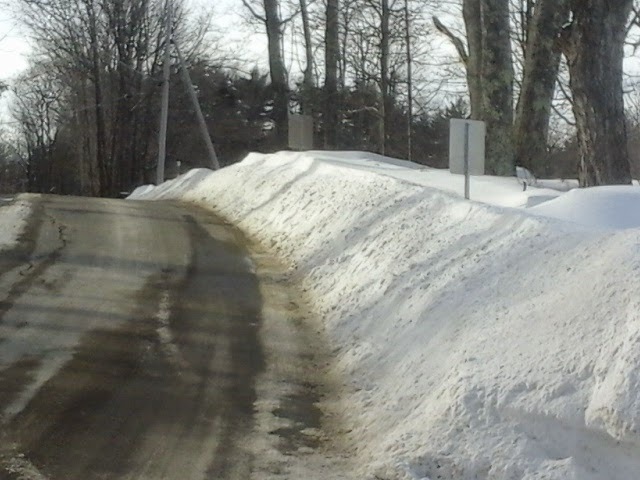 Sometimes, the winter mailbox is a bucket hanging from a hockey stick, stuck into the side of a snow bank. Ha! Life is so much simpler in NM. 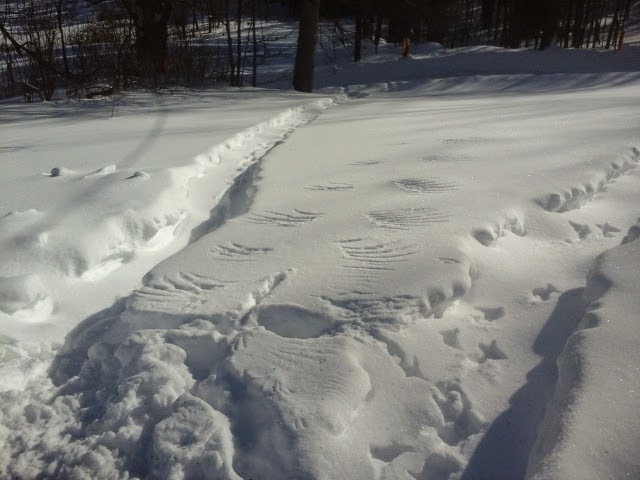 I have seen 12 inches of snow once 8 years ago and that was the most I have seen aside from a ski resort. Good luck with the bucket from a hockey stick! ;) You could have Steve design a mailbox from a pulley system so height could be adjusted to accommodate the snow. You would make a good yankee. Thats actually a common solution. plus a swing arm in case the plow hits it..ha!